Heart-healthy diets may limit saturated fat and sodium, but they don’t have to skimp on flavor while boosting your heart heath. Spinnerstown Hotel is one of many local restaurants that serves up tasty dishes with fewer than 350 mg of sodium and 550 calories, with saturated fat making up less than 7 percent of those calories. 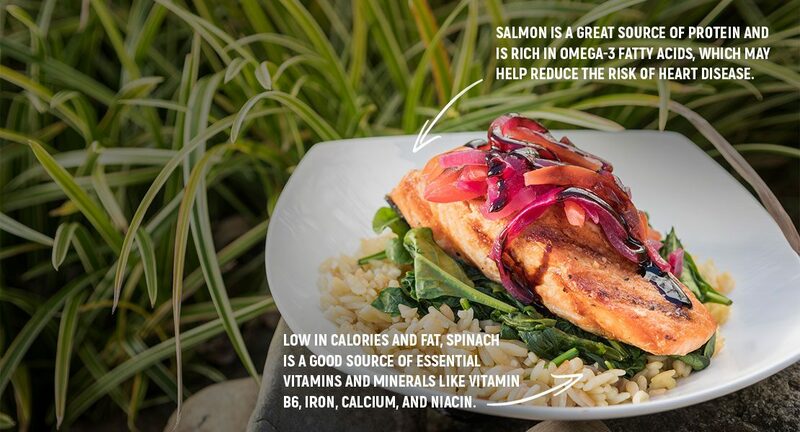 This mouthwatering plate of Grilled Salmon meets those guidelines, making it a heart-healthy dish, according to Debbie Cooper, RD, LDN. Salmon is a great source of protein and is rich in Omega-3 fatty acids, which may help reduce the risk of heart disease. Low in calories and fat, spinach is a good source of essential vitamins and minerals like Vitamin B6, iron, calcium, and niacin.